Trade Association of Information Technology (TAIT) has chalked out an action plan for execution of purchase boycott. TAIT organized a meeting to discuss the action plan of the purchase refrain with all members on Tuesday. The interactive dialogue among the members was with reference with FAIITA Advisory. 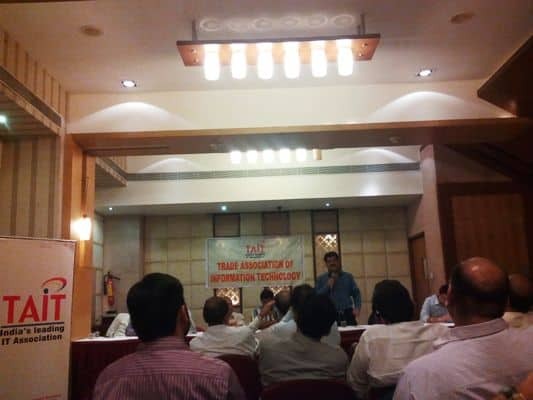 Mr. K. R. Chaube, TAIT President briefed the members about the background of the protest against predatory pricing and current status of discussions with the government, vendors and associations. Mr. Champakraj Gurjar, Regional Representative- India West, FAIITA was also present at the meeting. He updated the members on the series of dialog through meetings, email communication FAIITA had with the Vendors, National Distributors at National level. “If we want to fight for our survival in the industry, we need to unite ourselves and put pressure on Vendors”, Mr. Gurjar said. TAIT members unanimously resolved to support refrain from purchase from 15th December 2014 onwards as per the directives if the FAIITA. Members suggested not to raise Debit note on T1 Channel Partners (National Distributors) by the T2 (Sub distributors, Regional distributors) / T3 & T4 (Dealers, System Integrators, Retailers) Channel Partners on the price differential on their sell items by matching internet prices. “TAIT will put their efforts to convince T1 Channel Partners to take back their unsold stocks by Vendor due to these concerns”, Mr. Chaube said. During the panel discussion, TAIT members formed teams to initiate discussions with the government, NDs and Vendors. Members resolved to compile the evidences of unethical practice adopted by e-commerce marketplace and share with TAIT. The association appealed the members to share the Vendor name which is having predatory pricing issue for their products through e-commerce portals. TAIT members who are the Sub-Distributors, Regional Distributors were advised to defer their payments to National Distributors. Members unanimously agreed to make aware the non-present TAIT members present in the meeting about the gravity of the issue. TAIT decides an action plan of purchase restraint 5 out of 5 based on 1 ratings. 1 user reviews.